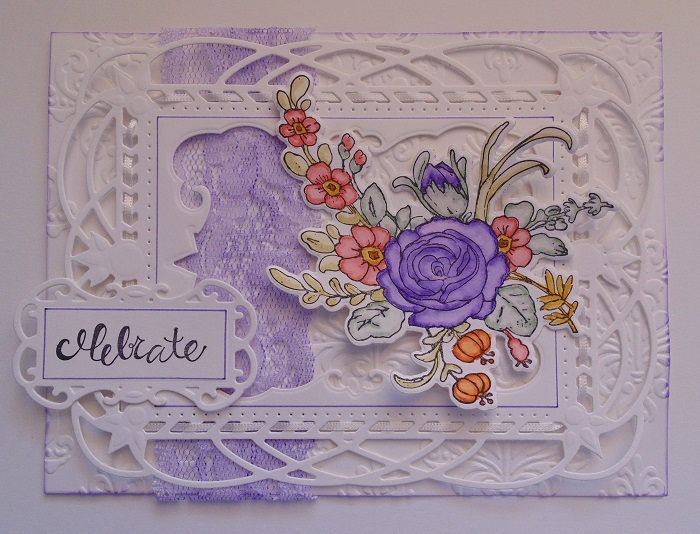 Today I’m sharing a card featuring the new Nouille Decorative Element from Stacey Caron’s Art Nouveau range. 1. 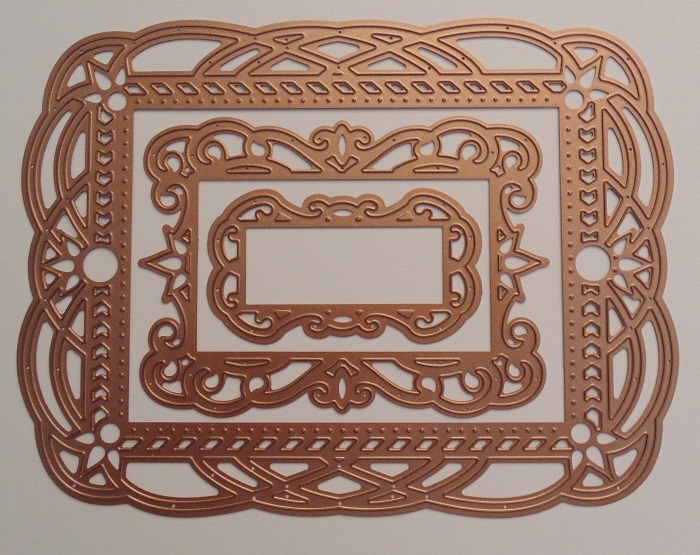 There are 3 beautiful dies in the Nouille Decorative Element Die Set. 2. Cut #2 and #3 dies together out of White Card. With the card still in the #3 die, for a different effect, use the fine tip of the Wilted Violet Distress Marker and draw around the inside edge of the die. Use the Tool ‘n One to remove the die cut from the die. Weave 1/16” wide White Satin Ribbon through the slits in the frame. 3. Stamp the image from the Flower Bouquet Stamp and Die Set using Jet Black Archival. Colour using Distress Markers. Use a Water Brush to move the colour around. 4. Stamp the sentiment from the Fresh Sentiments Stamp Set using Jet Black Archival. 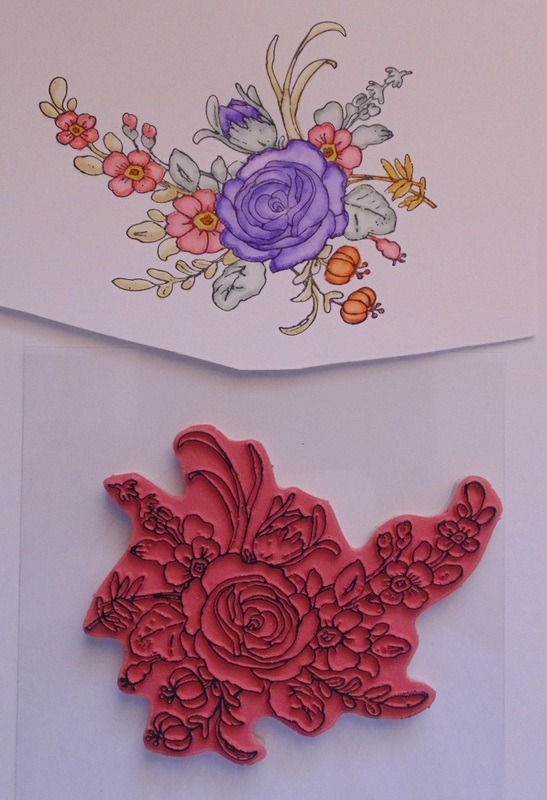 Cut the Flower image out using the corresponding die from the Flower Bouquet Set and cut the sentiment out using the #1 die from the Nouille Decorative Element Die Set. Leaving the sentiment in the die, draw around the inside edge of the die with the fine tip of the Wilted Violet Distress Marker. 5. 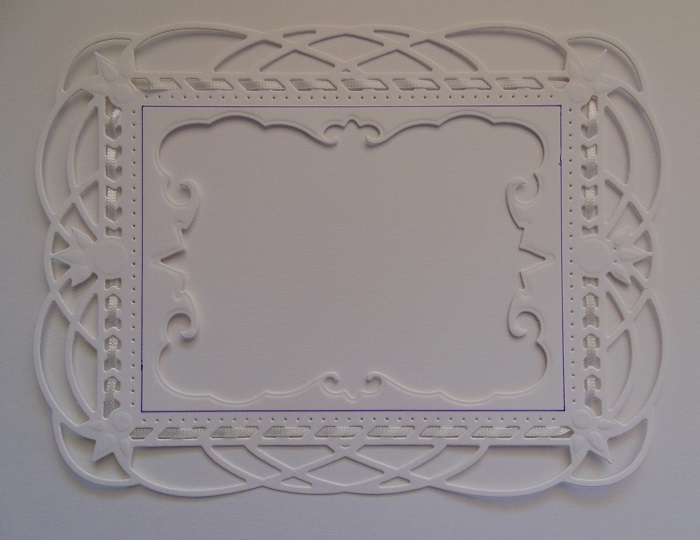 Trim a piece of White Card to 7” x 5¼”. 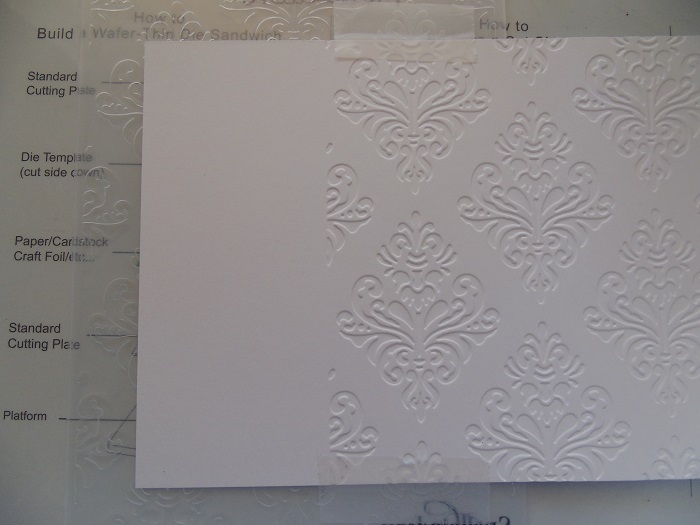 Emboss using the Medallion Embossing Folder. The card is bigger than the folder so you will need to run it through the Platinum Machine twice. This is easy to do. On the first run through, set the Platinum Cutting Plate away from the edge of the folder so as to not get a line from the edge of the folder. The design of this folder is a repeating pattern so it’s easy to slot a section of the already embossed area back into the folder and run through the Platinum again – it’s safest to secure the card with low tack tape. 6. 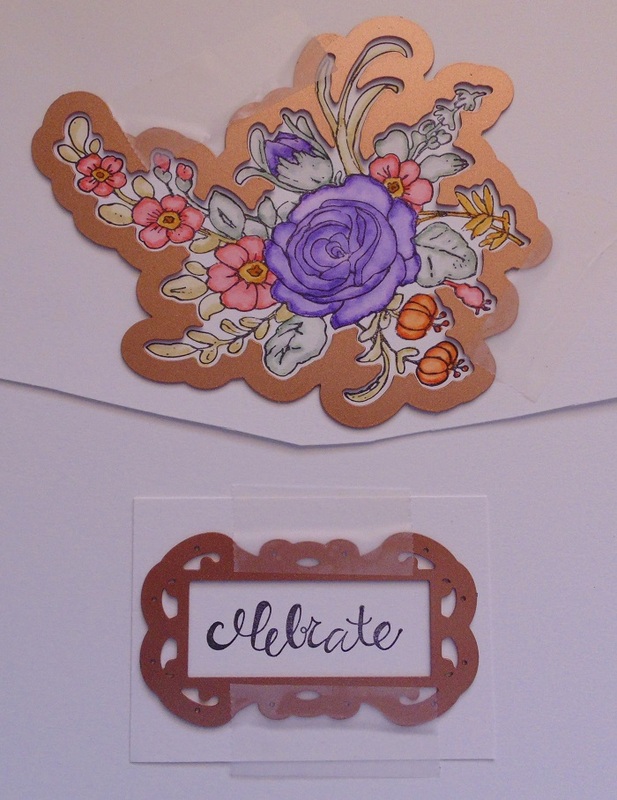 Edge the embossed area with Wilted Violet Distress Ink using the Circle Tip with the Tool ‘n One. Ink a piece of White Lace Ribbon. Glue the Nouille frame in place. 7. Add the image and the sentiment using 3D Foam. 8. Mat onto a piece of Black Card measuring 7¼” x 5½”. 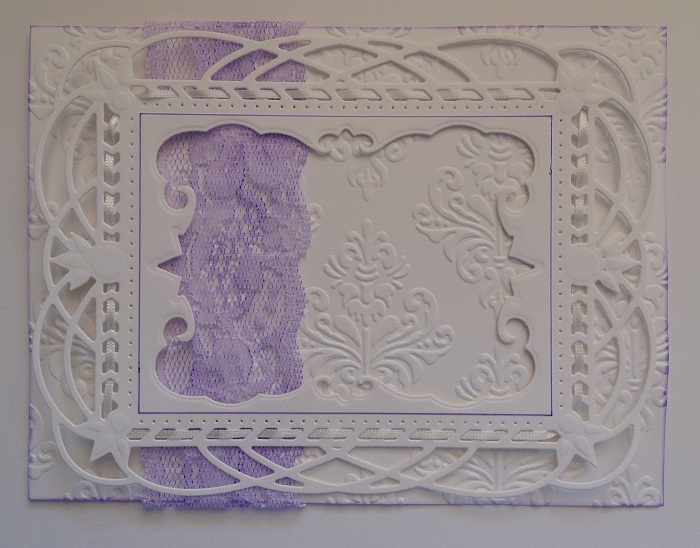 If you wish, add a White Card pierced layer measuring 8” x 6¼”, a Black Card layer measuring 8¼” x 6½” and a final White Card layer measuring 8¾” x 7”. Add some White Self-Adhesive Pearls. A card that can be easily adapted for many occasions and in many colour ways to suit. This is beautiful and I love the colours, and of course the Ribbon! Beautiful card, love the stamp and how you have coloured it. Nice one Julia! Like the ability to weave ribbon with this die. Beautiful Card, great dies and stamps and lovely colouring.